Welcome to the latest edition of FOX Renew/Cancel. This one will be quick and there won't be a full table since the latest sub-demo numbers haven't been released. Let me know what you think in the comments below! Why Is The Last Man On Earth A Likely Renewal? 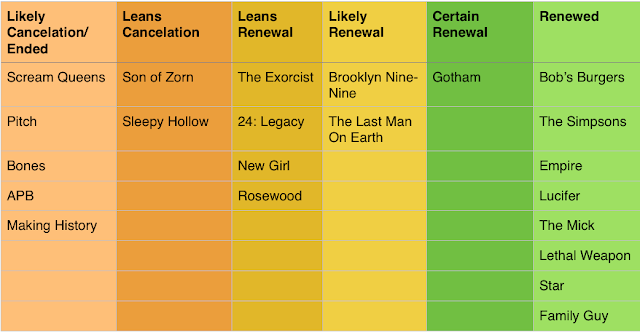 The Last Man On Earth returned better than I expected, and now sits at an 88 in A18-49 relative to the rest of FOX's average. More importantly, it's stronger than Son of Zorn and seemingly Making History, and I doubt all three Lord Miller Productions will be canceled. Add this with the fact that it sits 3 points above its estimated target and I think we will probably be seeing a 4th season. Why Is Making History a Likely Cancelation? Making History is already in the category farthest away from a renewal. While it could somehow be a massive player on non-linear platforms, that's an outside shot given it's already FOX's lowest-rated comedy in the best time slot they can give a comedy. Why Is Sleepy Hollow in the Leans Cancelation Category? It took this long, but Sleepy Hollow is now below its already low target. Now at a 45 in relative ratings, the veteran Friday drama has had a string of 0.4 A18-49 Live + Same Day ratings lately, not even managing to grow out of the reruns of Rosewood that air before it. Yes, there are five shows in Leans Renewal. The two veterans (New Girl, Rosewood) are a combined 5 points away from their targets, and by that metric all could really go either way. Meanwhile, I don't think they'll give up on 24: Legacy so fast given all the promotional push, and The Exorcist is actually one of the higher-rated FOX Friday 9pm fall shows in some time. Nothing would shock me right now with these five shows, and while right now all five are looking safe, I expect that to change.